In order to test Earth defense techniques and abilities needed for a future trip to Mars, NASA has detailed a plan to rip off a chunk of an asteroid, deliver it into a stable orbit around the moon, and send astronauts to study it and collect samples. Dubbed the 'Asteroid Redirect Mission' (ARM), the program is scheduled to launch sometime in 2020 and span at least half a decade. NASA originally considered capturing an entire asteroid and luring it into a lunar orbit, but the agency said it settled on poaching a chunk of a space instead, as doing so would test more capabilities necessary for a Mars excursion. "The Asteroid Redirect Mission will provide an initial demonstration of several spaceflight capabilities we will need to send astronauts deeper into space, and eventually, to Mars," NASA associate administrator Robert Lightfoot said in a statement. "The option to retrieve a boulder from an asteroid will have a direct impact on planning for future human missions to deep space and begin a new era of spaceflight." NASA said it is currently considering three targets for the mission – Itokawa, Bennu, and 2008 EV5 – but more are likely to be added to the list until 2019, when a final decision will be made. 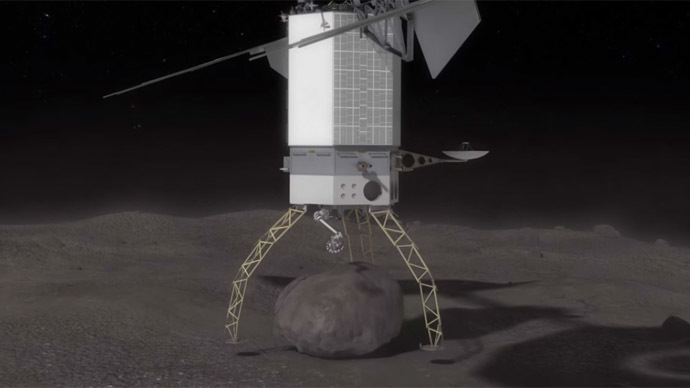 In terms of specifics, the mission proposes sending an unmanned ARM spacecraft to the asteroid, where it will commence a thorough analysis of the rock before approaching an ideal target and lowering itself. The robotic arm will latch onto a boulder (up to 13 feet wide) with specially designed microspine claws and take off once again. It will take about six years to bring the boulder into orbit around the moon. Once it arrives, NASA will send a manned crew in an Orion spacecraft to rendezvous with the asteroid chunk, and astronauts would then conduct spacewalks and collect samples before returning to Earth. NASA highlighted several areas in which the unmanned trip to the comet could aid a future mission to Mars. One involves a new method for powering spacecraft, called advanced 'Solar Electric Propulsion' (SEP). NASA describes this as “a valuable capability that converts sunlight to electrical power through solar arrays and then uses the resulting power to propel charged atoms to move a spacecraft.” It’s not as fast as traditional means of power, but it is more energy efficient and could cut down the cost of moving massive loads of cargo and supplies. If adopted, SEP technology could help NASA pre-position supplies for astronauts on deep-space missions so that they are waiting for the astronauts when they arrive. Meanwhile, the robotic spacecraft holding onto the asteroid will test various trajectory and navigation techniques in order to move the rock into a stable orbit around the moon. This could be especially handy for deep-space missions in which astronauts have to meet up with habitats that will then take them the rest of the way to Mars. As the ARM craft first nears the asteroid, it will start analyzing if and how its interactions with the asteroid alter the rock’s trajectory. Once it removes the boulder, further experiments will be done to see if the behavior affected the asteroid’s route. Then, before moving the rock into lunar orbit, NASA will test “planetary defense techniques” that will help the agency design options for redirecting an asteroid away from Earth. While NASA is billing the mission as an important step on the way to Mars, it is unclear if the agency will have enough political support to go through with it. ARM has a number of Republicans opposed to the project because they’d rather see NASA prioritize a return trip to the moon, and with the GOP in control of Congress that could easily complicate matters. There’s also plenty of time until 2019, meaning further alterations to NASA policy could occur. Still, NASA has placed increased emphasis on asteroid-related studies during President Obama’s second term.